↑ ৷ ৰাইন ছূইছ এল্পছৰ পূব-দক্ষিণ খণ্ডত উদ্ভৱ হৈ নেডাৰলেণ্ডৰ নৰ্থ ছি (North Sea) ত মিলিত হৈছেগৈ ৷Schrader, Christopher; Uhlmann, Berit (28 March 2010). "Der Rhein ist kürzer als gedacht – Jahrhundert-Irrtum" (German ভাষাত). sueddeutsche.de. http://www.sueddeutsche.de/wissen/981/507145/text/। আহৰণ কৰা হৈছে: 27 March 2010. ."Rhine River 90km shorter than everyone thinks". The Local – Germany's news in English. 27 March 2010. http://www.thelocal.de/society/20100327-26161.html। আহৰণ কৰা হৈছে: 9 April 2010. 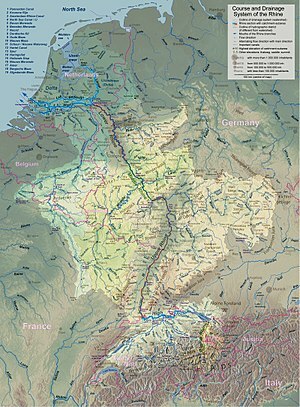 ↑ most notably the straighening of the Upper Rhine planned by Johann Gottfried Tulla, completed during 1817–1876. ↑ sum of Vorderrhein and Hinterrhein discharges according to Hydrologischer Atlas der Schweiz, 2002, Tab. 5.4 "Natürliche Abflüsse 1961-1980". ↑ Constance to Basel: Rheinkilometer 0–167. ↑ Average over the period 1961–1990: 1,297 m3/s (M. Spreafico und R. Weingartner, Hydrologie der Schweiz: Ausgewählte Aspekte und Resultate, Berichte des BWG, 2005, citing Schädler and Weingartner, 2002); regular yearly peak at 2,500 m3/s, exceptional peaks above 4,000 m3/s. Simon Scherrer, Armin Petrascheck, Hanspeter Hode, Extreme Hochwasser des Rheins bei Basel – Herleitung von Szenarien (2006). ↑ at the confluence of Aar and Rhine, the Aar at 560 m³/s carries more water on average than the Rhine at 439 m³/s, so that hydrographically speaking the Rhine is a right tributary of the Aar. ↑ Basel to Bingen: Rheinkilometer 167–529. 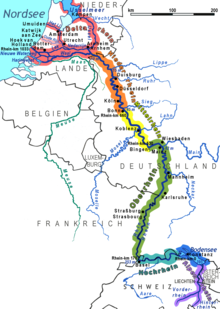 ↑ Bingen to Cologne: Rheinkilometer 529–688 (159 km); there is no unambiguous definition of the Middle Rhine, some would prefer to have it begin further upstream, at the mouth of the Main. Berndsen, Henk J.A. ; Stouthamer, Esther (2001). Palaeogeographic Development of the Rhine-Meuse Delta, The Netherlands. প্ৰকাশক Assen: Koninklijke Van Gorcum. ISBN 90-232-3695-5. OCLC 495447524. http://www.geo.uu.nl/fg/palaeogeography/books/palaeogeographic-development. Blackbourn, David (2006). The Conquest of Nature: Water, Landscape, and the Making of Modern Germany. প্ৰকাশক London: Jonathan Cape. ISBN 0-224-06071-6. OCLC 224244112. Cohen, K.M. ; Stouthamer, E.; Berendsen, H.J.A. (February 2002). "Fluvial Deposits As a Record for Late Quaternary Neotectonic Activity in the Rhine-Meuse Delta, The Netherlands". Netherlands Journal of Geosciences – Geologie en Mijnbouw খণ্ড 81 (3–4): 389–405. ISSN 0016-7746. http://www.njgonline.nl/publish/articles/000210/article.pdf. Frijters, Ine D.; Leentvaar, Jan (2003). Rhine Case Study. Technical documents in hydrology, no. 17. প্ৰকাশক Paris: UNESCO International Hydrological Programme, (Rep. No. SC/2003/WS/54). OCLC 55974122. http://unesdoc.unesco.org/images/0013/001333/133303e.pdf. Gouw, M.J.P. ; Erkens, G. (March 2007). "Architecture of the Holocene Rhine-Meuse delta (the Netherlands) – A result of changing external controls". Netherlands Journal of Geosciences – Geologie en Mijnbouw খণ্ড 86 (1): 23–54. ISSN 0016-7746. http://www.njgonline.nl/publish/articles/000306/english.html. Hoffmann, T.; Erkens, G.; Cohen, K.; Houben, P.; Seidel, J.; Dikau, R. (2007). "Holocene Floodplain Sediment Storage and Hillslope Erosion Within the Rhine Catchment". The Holocene খণ্ড 17 (1): 105–118. doi:10.1177/0959683607073287. Ménot, Guillemette; Bard, Edouard; Rostek, Frauke; Weijers, Johan W.H. ; Hopmans, Ellen C.; Schouten, Stefan; Sinninghe Damsté, Jaap S. (15 September 2006). "Early Reactivation of European Rivers During the Last Deglaciation". Science খণ্ড 313 (5793): 1623–1625. doi:10.1126/science.1130511. PMID 16973877. "Rhine River History". Encyclopædia Britannica. Encyclopædia Britannica Online. 2010. http://www.britannica.com/EBchecked/topic/501316/Rhine-River/34453/History। আহৰণ কৰা হৈছে: 29 March 2010. Roll, Mitch (2009). "Rhine River History and Maps". The ROLL "FAME" Family. http://www.rollintl.com/roll/rhine.htm। আহৰণ কৰা হৈছে: 29 March 2010.